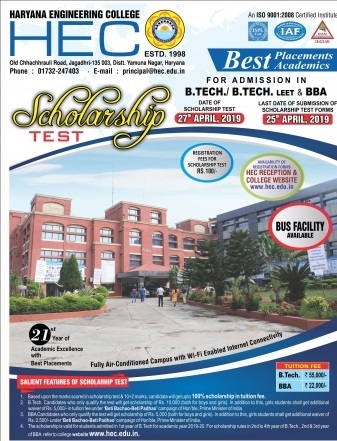 Scholarship Test for B.Tech, BBA and MBA courses will held on 27th Apr 2019 in Haryana Engineering College, Jagadhri, Yamunanagar. 2. Registration for Entrance is open till 25th April 2019. 3. Candidates shall report at the examination centre by 9.00 a.m.
4. Examination will consist of 45 objective type questions based on JEE Main pattern in the examination. 6. Candidates shall bring Black/Blue point pen for filling up OMR sheet. 7. Programmable calculators and mobile phones are not allowed in examination center. 8. Candidates must bring Admit Card with them at the time of Examination. No candidate will be allowed to enter in the examination centre without his/her Admit Card. 1. Based upon the marks scored in scholarship test & 10+2 marks, candidate will get upto 100% scholarship in tuition fee. 2. Candidates who only qualify the test will get scholarship of Rs. 10,000 (both for boys and girls). In addition to this, girls students shall get additional waiver of Rs. 5,000/- in tuition fee under ‘Beti Bachao-Beti Padhao’ campaign of Hon’ble, Prime Minister of India. ** All Semester DMC’s of B.Tech./B.E. 10th & 12th, Marks 80% And Above Rs 30000 Per Year For All The 04 Years Of Studies.